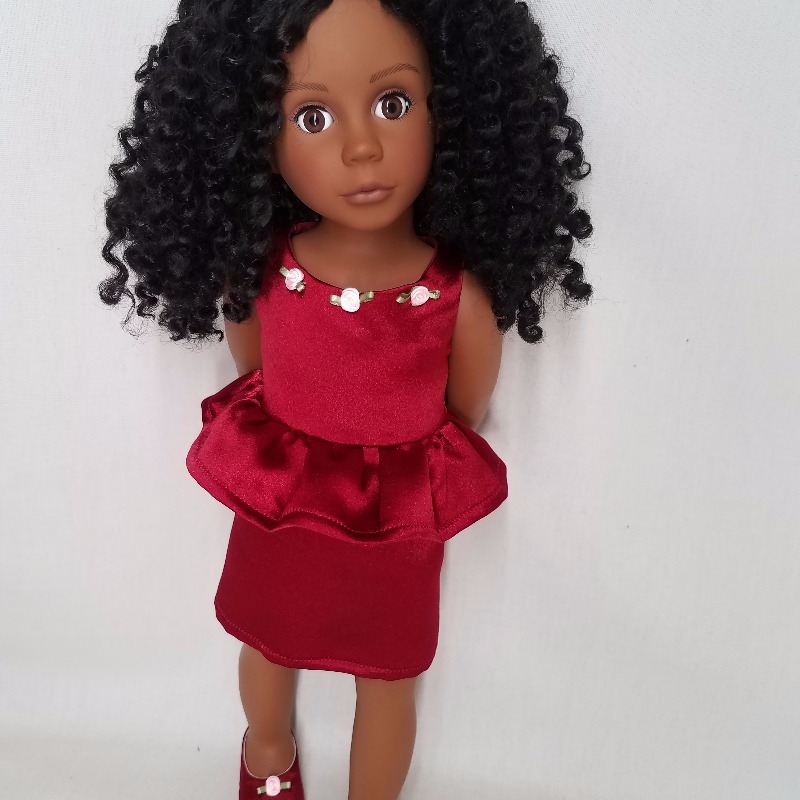 This is a sophisticated looking dress for those more formal occasions for your doll. The peplum gives a nice contrast to the fitted top and straight skirt. The dress has a hook and loop tape closure in the back. The bodice is lined. This PDF pattern is simple to put together except for a more complicated assembly of the bodice where the side seams are hidden. This is a cute dress. My first attempt was a little tight on my model AG doll, so I added a little to the back on each side. Now it fits perfectly. The pattern is easy to follow and the dress sews up quickly. This lovely little dress is perfect for anything from date night to church. It pairs beautifully with DK Perfectly Plaid Jacket 18" Doll Clothes Pattern for a complete ensemble. Dress is super simple to make, but the directions leave out instructions to clip corners before turning – a minor thing, but I’m thinking about the beginner (for whom this pattern is intended). Overall I give this pattern a big fat “A+” and a heartfelt smiley face! Thank you Soda Pop Street! Very nuce pattern, my experience was great, the instructions were easy to follow and it was easy to assemble. Thanks Pixie Faire. Very cute little dress and easy to make. I just made this darling dress--good instructions and went together easily. I did add about 1/2 inch to the back. My doll needs this extra space or the dress would have been too tight. I do this on most patterns. My AG doll must be one of the older ones.